Media stories are countless – President Donald Trump has acted more friendly toward Russia and Russian president Vladimir Putin. We must ask, why are Russian equities down 4% in 2017, 10% off their recent highs? It’s clear, the stress the White House is experiencing over its relationship with Russia is weighing on Russian equities. There were very high hopes the Trump administration could be more willing to roll back sanctions placed on Russia in response to its actions against Ukraine (Circa 2014-15). Of course, oil’s 2017 headwinds have played a key role here, much of Russia’s economic activity is centered around crude. Energy is by far the largest sector weight in the RSX. It’s no secret, Russia is one one of the world’s largest non-OPEC producers. Globo news, an internationally respected Brazilian network and news franchise, is reporting that the Chairman of JBS, the world’s largest meat company, has taped weeks of conversations with President Temer involving pay-offs to prevent imprisoned house speaker Eduardo Cunha from testifying in the Operation Car Wash scandal. Brazilian equities have surged over the past year as Temer’s administration forged on an ambitious reform program that cheered investors. Brazilians, however, are overwhelmingly opposed to his austerity measures and the president’s approval rating hovers at around 11%. Up 132% from the January 2016 bottom, stocks in Brazil have priced in a ton of political goodwill. The EWZ is set to open at the $34.20 – $34.50 level, below the two year trend line above in red. We believe the administration’s economic team is highly concerned the crisis will impact their reform agenda. The government has been positioning their long awaited, and very controversial pension reform proposal to the lower house of Congress. Equity prices / valuations are very dependent on completion / passage of these reforms. In our view, credit risk will surge focused on Brazil’s government bonds if the reforms collapse. The JBS CEO Josely Batista reportedly taped Termer ordering the executive to “keep up” the payments in one of the recordings, which are said to be damning throughout. Attorney General’s office while opposition lawmakers are calling for the president to resign immediately. If this occurs, the Brazilian Constitution requires that elections be held within ninety days. Technically, the real is moving to far weaker ground – a print above 3.21 shifts the currency into a new bear market. Per our friends at ACG Analytics, if Temer resigns or otherwise leaves office the Brazilian Constitution requires elections within ninety days. Brazil had been emergencing from it’s worst recession and consensus had been slowly but appreciably growing for Temer’s market based economic reform agenda. were political parties. Initial thoughts include increased attention toward Mariana Silva, a candidate of the left who surged in the 2014 elections but ultimately missed the second round vote. If she is not tainted by scandal, her stock certainly goes up. Brazil’s small but vocal hard right will receive attention as its calls for “cleansing” Brazilian politics through the instatement of military rule could resonate in some quarters. We’ll have a note out later today, but this is a BIG story. The U.S. dollar has broken its five year trend line. Across Wall St., lofty 2017 dollar estimates are coming down fast. Wall St’s calling for 2-3 more rate hikes this year, seven over the next two years – but Mr. DXY says no way Jose. The ultimate barometer for the Trump trade (tax cuts, infrastructure and deregulation) is signaling a major warning. 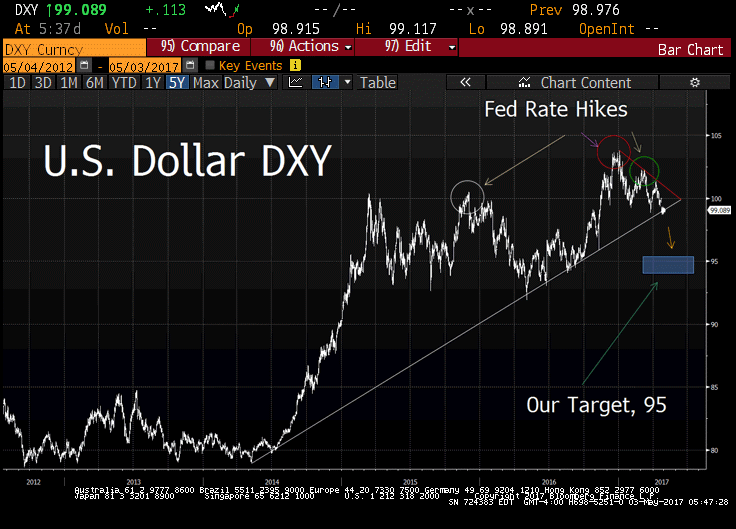 This image was produced on May 3rd and included in our Bear Traps Report, 95 target highlighted above with the DXY at 99.08 then. The dollar closed at 97.14, breaking a key technical level this week. Trump’s agenda in Washington is at Risk – So Are the Fed’s Beloved Rate Hikes. Is this Drama in Washington Impacting the Legislative Time Line? The simple answer is yes. Every minute that legislative and executive branches of the US government are focused on Comey-Russia is a minute wherein the tax bill, infrastructure, trade negotiations – homeland investment act or change to Medicare is not being debated, scored and advanced. Investors bought the dollar because Trump’s policies were going to be good for the greenback; without Washington’s legislative goodie bag (tax cuts – fiscal stimulus) we’re just looking at high drama on the world’s most important stage. 2. Equity valuations in Europe (Euro is surging, highest since November) are playing catch up with the U.S., as the President’s growth agenda still sits in stall mode – investors globally are reaching for alpha in Europe. 3. Credit risk on the consumer side is surging in North America at the fastest pace since the financial crisis; commercial real estate / REITS, auto loans, credit cards, student loans are all experiencing a significant rise in delinquencies and late payments – as a result, banks and financial institutions are pulling back lending. The U.S. dollar is responding to economic risks and moving lower. Likewise, an extremely low core CPI print relative to very high expectations is pushing down bond yields in the USA. We still see 2% before 3% in 2017 on U.S. 10s, our long held position. 4. Jack Welch was Right? Looking at the personal consumption component of GDP, the authors find that price measures likely show an overstatement of 0.2 percentage point in 2000, rising to 0.26 percentage point in 2015. Combined with some bogus measurement of quality changes in computer and software investment, the total effects would mean GDP growth is understated by a bout 0.4 percentage point for 2000, 2005, 2010 and 2015, according to the new paper. U.S. stock indexes rose to new highs as a rally in crude and dollar weakness sparked gains in commodities producers. Emerging-market assets jumped and Treasuries slid. On the other hand, beneath the surface there’s an ugly divergence. Only 58% of NYSE stocks are above their 200 day moving average today compared to more than 72% in February. This is the lowest reading since October and a sure sign of a very tired bull (market). Bottom line, 26% of the market is controlled by the top 15 stocks, there’s $5T of market capitalization in just those names. So when Apple AAPL, Google GOOG and Amazon AMZN march high, indexes like the S&P 500 which are market cap weighted don’t tell us the whole story. Not even close. The Nasdaq 100 is up 18% on the year while the Russell 2000 is only 2% higher. Forget about the noisy headlines, the truth is MORE and more stocks are being left behind in this bull market. Oil is on a roll. WTI is up 12.4% from the May 5th lows while Brent 12.1% higher in a beautiful counter trend rally. Higher oil prices, infer higher inflation, which should drive interest rates higher. Typically, 5 year break-evens track this spread and move higher (break-evens help market participants measure inflation expectations). However, so far today rates are broadly stuck near their post CPI lows from last week. This speaks to the large bid for bonds. It looks like rates will want more time to assess the quality of these production cuts. The market wants to see if there is a more meaningful impact on oil exports, which have not really slowed from OPEC countries post the November deal. The front end of the oil futures curve has surged (orange line above) relative to 2019 pricing contracts. What does backwardation mean for rates and the FOMC? What we have seen since the November output cuts from OPEC, US inflation expectations move in close lockstep to oil prices, but more importantly, the structure of the oil curve. Following the news that Russia and Saudi Arabia are willing to extend the current cuts by nine months, the calendar 18 brent spread went back into backwardation. China’s impact on global property prices is colossal. Massive – debt build funded infrastructure spending pumped up commodity prices globally. Shadow banking leverage in China helped pump up commodity prices 2010-17. This had a substantial follow-on impact on Canada, Norway and Australia real estate prices (these countries are oil and materials rich). Likewise, $1T of currency outflows from China had to go somewhere, likely into real estate markets globally, hello Vancouver. Since 2007, U.S. real state prices are down slightly while property markets in some other G10 economies experienced no such downturn. The side effects of easy money central bank policies are visible here. Even with the global recession: prices, building activity, and mortgage credit continued to rise in fierce fashion. In several instances, the run-up has gone far enough that it has raised concerns about the broader consequences for economic and financial stability if real estate markets were to sour. While prices are extremely overvalued in several markets, there are also important differences across countries, and some important idiosyncratic factors to take into account. Bottom line; leverage, China and commodity prices have had a heavy hand in this disconnect. Almost ten years to the day, history is repeating itself – right in front of our very eyes. It was the spring of 2007, New Century had just gone bust. The subprime mortgage lender was the biggest story on Wall St., and when reporters finally got ahold of Federal Reserve Chairman Ben Bernanke, he did what all central bankers do on the eve of a credit crisis – try and keep investors calm. In 2007, our Larry McDonald led a team at banking over $150m in profits betting against New Century and other subprime lenders. He has an entirely different perspective. “The truth is very elusive as you’re heading toward that giant iceberg, the Captain wants those fannies in the seats. Believe half of what you see and none of what you hear.” McDonald said. We believe the credit cycle has turned in North America, whether you’re looking at Mall Reits, credit card receivables, auto or student loans – defaults are spiking at an alarming rate. Fasten your seatbelts ladies and gentlemen. Moody’s downgrade of Canada’s biggest banks beat down assets in a market already rattled by woes of mortgage lender Home Capital Group Inc. Yet, very similar to 2007 – most analysts say this isn’t evidence of an impending crisis. Investors are concerned that Home Capital’s troubles can lead to broader financial contagion, tipping Canada’s economy into the kind of crisis it averted in 2008. Still, home prices are at “the top of our list” of issues that could threaten Canada’s financial system, Poloz said. Poloz didn’t rule out the possibility of providing an emergency loan to Home Capital but stressed the need for a private solution to the co.’s issues. Poloz trusts private system to continue stepping in to support Home Capital. Singapore company involved in coal and funded by global yield hungry investors. Has $3.3 billion net debt and makes $125 million negative cash flows. Only hope was President Trump buying all that coal. The company reported a quarterly loss of almost $130 million – won’t return to profitability until at least 2018-2019. All part of our Lehman 10th anniversary book, coming Sept 2018. 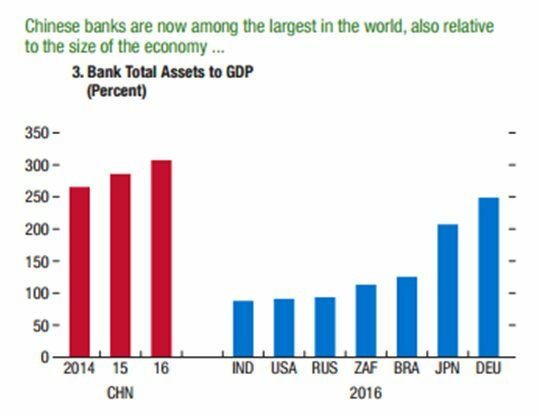 Much of the leverage build out in the global commodity space comes from the colossal banking system in China relative to the country’s economy. China’s banking system and underlying economy is far more leveraged than her global peers. The tailwind from China is rolling over as they de-lever. The gravy train is not making its next stop. From 1990 to 2015, Chinese consumption of refined copper increased from 622kt to 10.6mt, explaining nearly 92% of the total growth in global copper demand. Looking ahead, the growth in the Chinese demand for industrial metals is likely to be much more muted, also contributing to lower commodities returns relative to historical experience. The insanity of the current global credit profile is on display right here. If you want to buy default protection on the MOST levered economy on the planet earth, its very cheap. This reminds us of Citigroup in 2007, default protection was extremely cheap relative to the underlying credit risk, investors didn’t care. History is repeating itself RIGHT before our very eyes. essayforme on Electoral College Tie? What are Stock Market Volatility and Junk Bonds Telling Us?